﻿It's been said that litigation brings out the worst in people, but mediation brings out the best. Family and custody issues that end up in court costs more money and often results in neither side "getting their way." Also, children get caught in the middle and could result in long-term emotional distress. 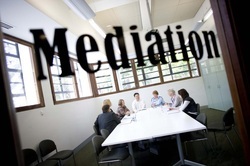 Mediation is an alternative to going to court that provides the opportunity for both sides to come to an agreement. As a Licensed Professional Counselor with a family mediation certification, I will help you facilitate an agreement that will ideally be a "win-win" for everyone involved. To schedule a mediation appointment or to obtain more information, please call me (504-606-1267). To make a secure payment for an appointment, please click the "Buy Now" button on the bottom of this page.